There is a new challenge at Polkadoodles starting today- Cream and Sugar. You can enter here. Looking forward to seeing lots of gorgeous cream, pink, brown and white coloured creations. I was torn between so many of the collections at the Polkadoodles store this week. I decided to make another cat creation using the new Work and Play 12 collection. It is available as a CD or digital download. You can also buy the cat as a digi download here. I coloured the cat using Prismacolors. The sentiment and flowers are from the Work and Play 12 collection too and the Wooden paper is from Work and Play 10- Country Life. I have already used this collection so much. All elements have been inked with Brushed Corduroy distress Ink. I have used two sets of Spellbinders dies- Beaded Circles and Foliage. Pearls, twine and Pink bling are from my stash. I think I will keep this card for my Mum's birthday. Absolutely loving playing with this collection! Love your kitty card! Thanks for linking up at Cardz 4 Galz! I love this card! Great image, design and fab detail. Great to have you joining in the fun at CRAFT this week. Brilliant, card the cat is fabulous. Fabulous make and adore the colouring. I'm loving all the details on your card. So cute! So glad you joined us at CRAFT Challenge this week! 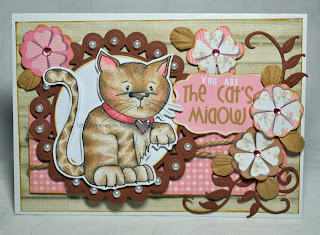 I love your kitty card done all in pinks and browns! so cute! Very pretty, I love the added bling :) Great colouring too. Loving this one, great card.